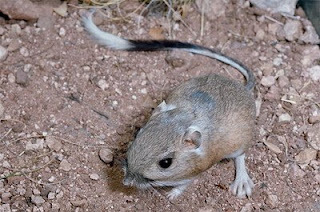 A large, four-toed, long-tailed kangaroo rat; tail about 1.5 times as long as head and body, with a distinct white tuft at end; hind foot broad and usually 50 mm or more in length; upperparts dark buff; black facial markings and stripes on tail conspicuous. External measurements average: total length, 350 mm; tail, 210 mm; hind foot, 53 mm. Weight, 115 g. Dental formula as in Perognathus flavescens. Distribution in Texas. Occurs in western and central Trans-Pecos region and north to Lubbock County. 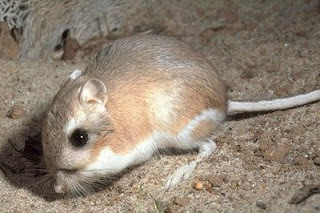 This large kangaroo rat appears to be limited in distribution to sparsely brush-covered slopes and low hills at elevations usually between 1,200 and 1,500 m. In Trans-Pecos Texas, it is most abundant on slopes covered with scattered, mixed stands of creosote brush and acacias on hard and moderately gravelly soil. It has never been encountered in loose soils or drift sands. The large complex mounds of these rats are unmistakable evidence of their presence. On soils that will pack and withstand weathering, the mounds may be over 1 m in diameter and from 9 to 130 cm in height, but on sandy soils they are less pretentious. As many as a dozen openings admit the rat to the complex system of galleries and side branches, and from them lead conspicuous trails across the surrounding sparse vegetation to the feeding areas. In addition, subsidiary burrows or "duck-ins" are relied upon for protection. Usually only one rat occupies each den. These rats are exceedingly fleet and agile, and to catch them at night by running them down is no mean feat. Once in the hand they can inflict painful wounds with their teeth unless handled carefully. Their food is almost entirely plant materials with seeds ranking high on the list. Green vegetation is eaten on occasion. Large quantities of food are stored in the dens to carry them over the periods of scarcity. Stores from a fraction of a gram to well over 5 kg have been found. 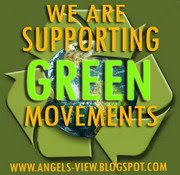 Charles Vorhies and Walter Taylor listed 13 species of grass and 29 other plants that contribute to their diet. Needle grass, grama grass, mesquite, and a composite weed (Aplopappus) were the most important foods. They seldom drink, even if water is present. The breeding season begins in January and continues into August. 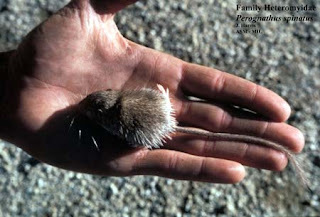 The young begin to appear in March, sometimes as early as February, and nearly full-grown juveniles are common by April. The gestation period is not known. The young are naked at birth, and the eyes and ears are closed; the number per litter varies from one to three but usually is two. 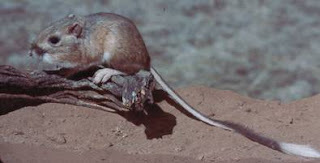 They are born in an underground nest composed of fine vegetation and chaff refuse from the food. Nest chambers vary in size from 15 by 20 cm to 20 by 25 cm. Their known natural enemies include badger, swift fox, bobcat, and coyote. Other animals also probably prey upon them. 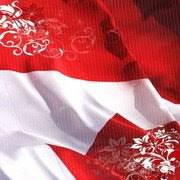 Banner-tails are sometimes of economic importance locally. In periods of drought they may do serious damage to rangelands by gathering and eating grass seeds. In such places, controlling their populations may be necessary.